(1968 'Delmark') (38:14/12) Was für eine schöne Überraschung! Magic Sam - voc/gtr zu Hause im Wohnzimmer; unveröffentl.Amateuraufnahmen in akzeptabler Qualität / what a nice surprise! 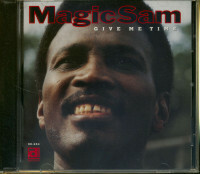 MAGIC SAM - voc/gtr, alone in his living room; amateur recordings that sound ok; prev.unreleased. 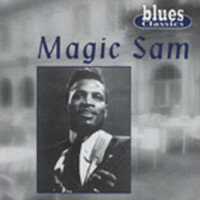 Magic Sam, like another Sam who lived in Chicago, Sam Cooke, was among the greatest vocalists of all time. Those who appreciate intense, passionate blues/soul singing will love this album. Although Magic Sam was also a genius guitarist, guitar afficianados would do better to experience any of the other Magic Sam Delmark releases. 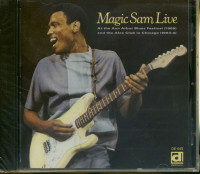 Similar to Magic Sam Live (Delmark 645) these performances were recorded by a Magic Sam fanatic, on a home tape deck. In this case, though, there was probably no remote thought or plans that the material would ever be released on the commercial market. Bill Lindermann was a close personal friend of Sam's. 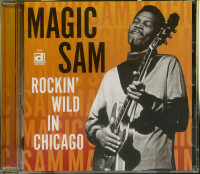 He recorded this album at Magic Sam's house in January 1968 and was also involved in the earlier studio recording of six songs by Sam, four of which appear on the anthology Sweet Home Chicago (Delmark 618) and two on The Magic Sam Legacy (Delmark 651). The recording quality of 'Give Me Time ' is not that of a session done at a professional studio, however, all that is currently technically possible has benn done to the original tape source to provide the best sound possible. You'll hear things like Sam's kids playing in the house, somebody playing hand drums on one song or somebody reacting to Sam's sining with a heartfelt 'yeah!' That's the informal and intimate nature here. Rare photos taken by Lindermann at Magic Sam's house which have never before appeared anywhere are enclosed within as well as complete liner notes by the founding editor of Living Bluies Magazine Jim O'Neal. 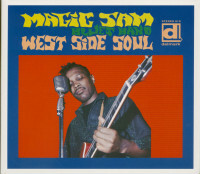 If you don't have any Magic Sam albums we suggest you start with West Side Soul (Delmark 615) and Black Magic (Delmark 620). 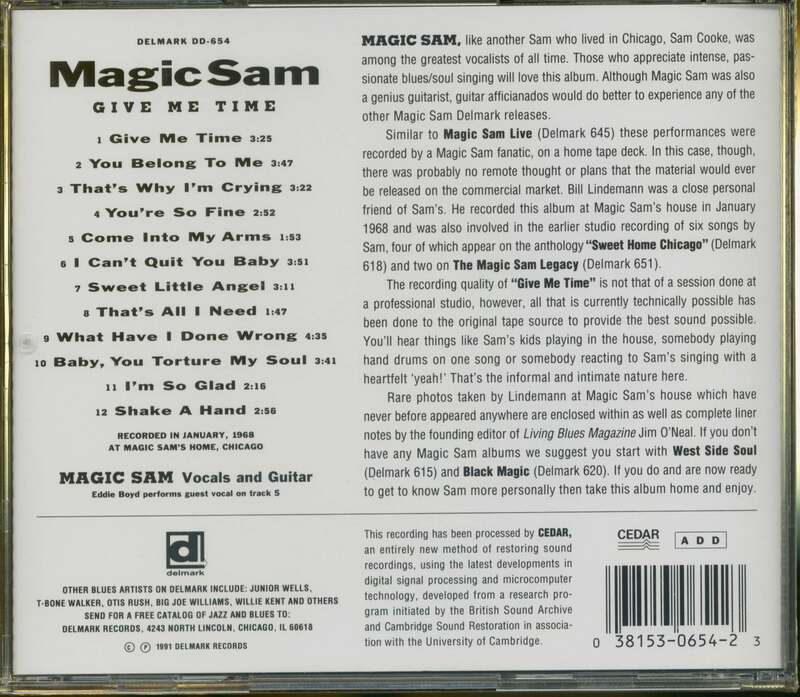 If you do and are now ready to get to know Sam more personally then take this album home and enjoy. A new blues sound was cooking on Chicago’s West Side, and ‘Magic Sam’ Maghett was its head chef. Stripped of harps and horns, the blossoming West Side sound centered on the electric guitar, positioning Sam and his peer Freddie King as prototypical blues guitar heroes. They didn’t mind stretching out on their axes, and they had plenty to say. Sam’s ringing guitar approach, soaked in minor-key majesty, did have a few discernible precedents, but it was basically his design. Born February 14, 1937 a little ways east of Grenada, Mississippi, Sam started out on diddley bow, a one-string contraption hung on the wall and fretted with a slide. One of his childhood pals was a towering lad named Morris Holt, who he’d later anoint with the handle of Magic Slim after both were resident on the Chicago circuit. "We played acoustics, on a Sunday up under a shade tree after we’d go to church and come back," says Holt of their shared childhood. Sam’s aunt Lily sent for the lad to come up to Chicago in 1950. Not long after, a youth named Sylvester Thompson moved into the same South Side building that Sam lived in. "I met him on the steps. He was playing guitar one morning when my brother Mack and I came in from the cab, from the Illinois Central station," says Thompson, better known now as R&B singer Syl Johnson. Syl struck out on some Mississippi blues right there on the doorstep, impressing Sam. "He was like playing ragtime when I first met him. And he kind of went wild when me and Mack came," says Syl. They continued to jam together in months to come, soon attracting the interest of Sam’s uncle, veteran harpist James ‘Shakey Jake’ Harris. "My mama got me an amp and a guitar. We put that amp in the window," says Syl. "That’s how old Shakey Jake found us. He heard the music. He said it smelled like he was a dog, smelled the other female dog down when she’s in heat!" With Shakey Jake encouraging him, a teenaged Sam sat in at the 708 Club in 1955, soon gigging under the moniker of Good Rocking Sam. Sam and Mack sent a demo of All Your Love to Chess, but they were turned down. "‘All Your Love’ derived from one of Lowell Fulson’s songs, ‘It’s All My Fault,’" reveals Syl. "Cause Sam told me that’s where he got it from. He copped it off of that." Otis Rush had a better idea than Chess. "I met Sam after I did 'I Can't Quit You Baby,’" says Rush. "He was trying to get with a recording. I turned him on to Cobra." Situated on West Roosevelt Road, Eli Toscano’s Cobra Records had already enjoyed success with Rush’s debut single and clearly pictured Sam connecting on the same level with his debut All Your Love, waxed in 1957 with a two-bass setup (Mack on electric, Willie Dixon on upright), pianist Little Brother Montgomery, and drummer Billie Stepney. Mack also dreamed up Maghett’s snazzy new Magic Sam moniker. The swaying, minor-toned All Your Love established Sam as the new king of the West Side. "It was one of his biggest," says Syl. "It was a classic." Sam released three more fine singles on Cobra before the Army came calling, much to his dismay. Customer evaluation for "Give Me Time"